Men's rugged belt with an interchangeable buckle. Whether you're waist-deep in a river or soaked in sweat, this hardworking belt can take what you dish out. It's made of durable top-grain cowhide leather. Unsnap the fasteners and swap in your favorite buckle. Carhartt, Inc. will cover premature failure of any of our products caused by a defect in the original materials or workmanship. Carhartt, Inc. has the right to repair or replace any damaged merchandise at its option and expense. Any product that is no longer in production and cannot be repaired will be replaced with a comparable Carhartt product. Since all accessories have an expected service life, this commitment does not cover damage caused by normal wear and tear, misuse, neglect, or obvious abuse of the accessories. In those cases, Carhartt’s repair center will determine the disposition of the accessory, be defective, we will repair, or replace it. However, Carhartt, Inc. assumes no liability for replace or restoring any alterations, embroidery, or other ornamentation added to the garment after its original manufacture. This is my 3rd Journeyman Belt. We appreciate your feedback. Please contact our Customer Service Team at 1-800-833-3118 if we can assist you in any way. Disappointed that there is no exchange program, only returns. Called to inquire and was told the person I spoke with would email me a return postage address so the postage would be paid by Carhartt. Never received the email so I will mail it myself. Seems like too much paperwork with credits, debits, etc. Leather feels a bit cheap and width of belt is just not wide enough. I know 1.5” is pretty standard but a 2” width belt option would be nice, it just feels and looks more masculine. We appreciate your input. Please contact us at 1 800 833 3118 if you need further assistance. Nice belt. Good quality leather. Belt fits and feels good. I have had this belt for the last 12 years and it has held up extremely well, if I ever need another one this is the first I'll be buying. Lost weight and needed a smaller belt. Already had this belt in the larger size. I wear it almost everyday and it's held up very well. This is my go-to belt! great belt for work. thick and strong. I'm happy with the belt. It does it's job well. I do IWB carry and it does well with the weight. It does have some kinks in it from the belt loops due to daily sweat. I wear a 52 waist pants and in the past have gone one size larger, (54), to accomodate the pants and waist. Since purchasing the belts, I have cut 5 holes, each one 2.4mm. left edge to left edge so the belt will be functional. I gathered that measurement from the pre-cut holes. Aside from that, the belt is a heavy duty, attractive, and comfortable. We appreciate your input and are sorry to hear this. 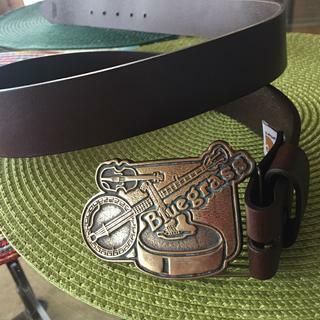 We do typically recommend going up a size when ordering our men's belts. Please contact us at 1 800 833 3118 if you need further assistance. This belt is PERFECT! It is not stitched together, it is one solid hunk of top-quality leather. It is thick -- over an eighth of an inch thick -- and an ideal inch-and-a-half wide, just right to securely and comfortably hold your pants up, but still fit thru the belt loops on your pants. AND it is sized exactly correctly. Good belt overall. Used as an HVAC journeyman for close to a year so far. Took a lot of crawling and dragging and scraping. Belt shows its wear pretty fast but doesn't seem to be falling apart yet. For the price I'd buy another. Thank you for your feedback. Please contact us at 1 800 833 3118 if we can provide any assistance. It's a good belt, I just wish it wasn't made in China. The finish on it seems a little like plastic. Belts were as advertised and were delivered promptly. I would definitely buy from this retailer again. I've owned this belt a bit over half a year, and it has softened up since I purchased it. Seems like it will last a very long time, and it holds up my pants. Carhartt quality at a very good price. Best work belt out there! This belt fits nicely with all jeans and pants. A great purchase. I was surprised when the first time I put the belt on the edge trim of the belt lost the dark edge. I hope the rest of the belt keeps it's color. The quality is ok. Not really what I expected for the price. Could have picked up a redwing belt for the same price point and had a better quality belt.Not to mention it runs too small. Only the last hole can be used. I recommend ordering a size larger than what you normally would. Disappointed in the purchase but it took forever to get here so I decided to just keep it and not send it back as I was in grave need of a new belt. We work hard to offer the best in durable workwear and your comments have been shared with Quality Control. Please contact Customer Service at 1 800 833 3118 if we can further assist in this or any matter. I love it, it looks great and feel perfect. Beautiful quality leather. You can unsnap the buckle and use your own favorite. We bought this to replace the same Carhartt belt that was 30 years old! Made to last a lifetime. Both I've owned lasted about 3 years before the pin breaks. Think I'll try a different belt this time. We have contacted the customer directly regarding their review. Good belt, just don't let dogs get ahold of it. Full cowhide, quality belt hard to find these days. I've struggled to find belts (48") strong and durable enough to wear every day with casual clothes. Then I found this one and now it's my go to belt. It looks good, has a great buckle and is thick and strong enough to handle my large size. And I find it comfortable. Great belt, fits nice, good quality. A belt you can wear to work and out on the town. Second journeyman belt I've bought, I like the look and the stand-up over time. Great work belt. Use it with my Carhartt work pants. Good feel and looks decent even on dress pants. It's s great belt all around. It's a great overall belt. I've had this exact belt in black and have worn it everyday for at least 5 years with no issue at all. My shoulder strap toolbelt did cause belt to sag a little, but other than that great belt. Ordering again same belt ! The two layers of leather separated after less than two months. They are glued together, not stitched. It's a beautiful belt, but the early failure makes it unacceptable. The material quality and fit and finish of this product exceeded my expectations. I ordered this to wear with jeans but I can also wear this belt with western slacks. I've had this belt for 5 years and if I hadn't gotten skinnier I bet I'd have it at least a couple more. The leather has warped a bit at a certain length so it bulges funny when I tighten it. This belt has been drenched with sweat a thousand times and I'm sure I swam in it a few times. Why don't you sell this belt in size 30!?! I've had to poke holes in it twice to shorten it. It's that good of a belt that I'd even buy one that doesn't fit. Not only are these belts comfy, they are also durable and strong. As a roofer, I need something that can handle the tough textures I encounter, like slate and metal. It will have to takes a lot of wear out this belt! Product doesn’t live up to Carhartt repetition “Rugged & Durable”. The Snap fasteners that hole the buckle into the fold of the leather simply do not hold. The snaps are continually releasing causing the buckle to hit the deck ( separate from the leather). I was surprised when this belt arrived as I had expected it to be much thicker. My belts often break at the buckle because of the strain on the leather loops. For the price I had hoped this belt would be thicker than other cheaper belts after a few wears it is already showing signs of strain. great belt, fits well, good price. This is an excellent belt. 5+ stars! Durable and great looking. What is the width of this belt? Will This fit a child? BEST ANSWER: We recommend the kid's version: https://www.carhartt.com/products/Journeyman-Belt-For-Boys-4254. I have a nickel allergy: watches and belt buckles that contain nickel, or nickel alloys, give me an itchy and annoying skin rash. Are any of your belt buckles nickel-free? BEST ANSWER: Our metal belt buckles will all have a nickel core. Is this belt one piece of leather or is it 2 and will separate like some other belts ? BEST ANSWER: All of our belts are now single-ply (one piece of leather). They are made to be durable. Please feel free to call Customer Service with any further questions. Can you condition this belt with oil? BEST ANSWER: No, you are not able to condition this belt with oil. The website says the belt is "top grain" leather, but at a store the belt had "genuine" leather stamped on it, a much lower grade. So what's the deal with the website description?? Is this the replacement belt which holds the tool pouches? BEST ANSWER: nope just for jeans but great belt for work and going out. Its just a regular belt. Do you have that journeyman belt in double stitching? BEST ANSWER: We apologize, we do not. This style is a single ply, full grain leather strap with no edge stitch. It features a plain cut edge. is the belt made in China? BEST ANSWER: This style is made in China, Indonesia, Vietnam and Asia. What if I need a belt that can have a belt buckle attached to it do u have those kinds of belts? Journeyman belt country of origin?? BEST ANSWER: This belt is made in China. What is the thickness of the belt?